They certainly got something of a mixed reception (to put it mildly) on the forums, but if you were taken by the Ikon Bruce Foxton shoe, you can pick them up from this week. 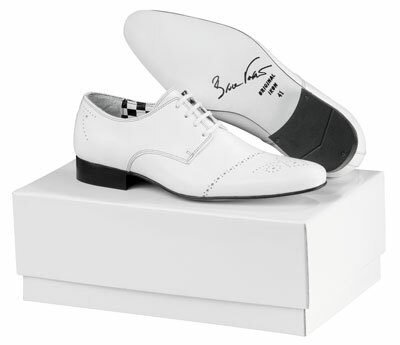 You can read about them here, but to sum up, they’re a four eyelet Gibson shoe in white full grain leather with light punch detail, black and white checkerboard calf linings and Bruce’s signature laser etched onto the white sole. Each of the 500 pairs is numbered and sold in both a cloth bad and ‘luxury shoebox’. You can pcik up a pair for £65, with Cazual doing them with free postage.